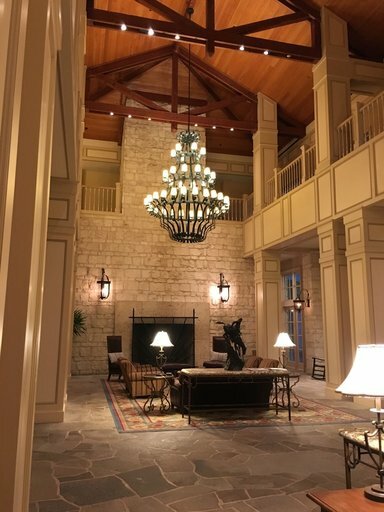 So, when I learned I was going to a marketing conference in the Texas hill country, I was happy I didn’t have to drive far and that I could show my co-workers around my home state. Now, to be honest, I wasn’t as jazzed about the conference itself. I’ve been to many marketing events - some good, some okay at best, all claiming to be different and better than the last, but usually, it was all talk. What I wasn’t prepared for was how much I would love and learn from CXL Live. Below are the behind the scenes reasons I thoroughly enjoyed attending and why it truly was different from any other marketing conference I have been to. (Note: If you want to attend CXL Live 2018, you can save $350 with the promo code impact-sent me)! If you’ve been to INBOUND, you are probably accustomed to events with lots of inbound marketers, mostly users of HubSpot, that you meet and get to talk shop with. This is all great, but sometimes you don’t get as much out of it due to the homogenesis crowd. What was neat about CXL Live was how diverse the attendees were. There were UX designers, CEOs of crazy successful companies, Google and Apple team members, and of course, inbound marketers from all over the world, all in one space learning cross-functional things from each other. In this environment, you learn just how small the inbound world is and that there are so many other influencers to learn from and connect with. The lobby at our sophisticated, yet relaxed resort. Can't you just feel the Texas vibe? The conference itself is set in a rural, glamping-like hotel, so you feel like you’re at a conversion marketing summer camp where you get to meet lots of cool people and learn a completely different side of marketing than we inbound marketers are traditionally exposed to. Everyone is so passionate about their different expertise. What we all had in common, however, was how much we all geeked out on marketing conversion. It was a refreshing and invigorating experience. CXL Live had my favorite schedule of any conference I’ve been to. The days ended around 5:00 pm, and each day was filled with quick, but powerful sessions to hold our attention spans and plenty of breaks with fun yard games (and beautiful, April Texas sunshine) to refresh your energy. I’m not the best networker, so what I loved about CXL Live is how casual and relaxed the setting was. It was laid back and socializing never felt forced. In the evenings, aside from getting to have dinner and meeting amazing people, you could have a glass of wine under a tea light-lit tree on the Texas countryside or compete in more yard games. For the late-night crowd, there was even karaoke and plenty of bars to boot. After a fun-filled day, sessions started no earlier than 9:30 am which gave you time to work out, catch up on anything work-related, and ease into another jam-packed day without feeling like you just rolled out of bed. Don’t just take my word for it! I went with 4 other co-workers, and here’s what two of them had to say. 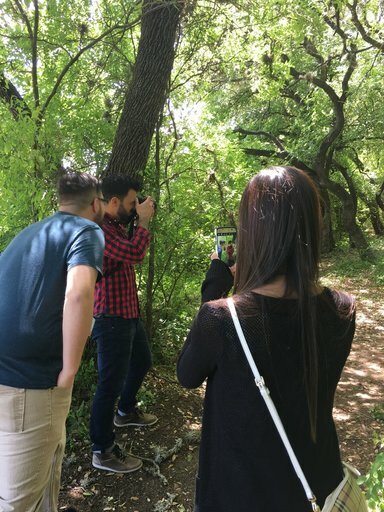 During one of our breaks, we took a nature hike. Here's Kaitlyn taking a picture of Tom taking a picture. Woah. I have never been one to get starstruck around a celebrity, but you put me in a room with Peep Laja, and I have the potential to freeze up! It’s surreal meeting people in person you’ve learned from and looked up to for many years, but once you get past the “Oh my gosh, I know him!” feeling, you get to have some really good conversations. We had dinner with Oli Gardner from Unbounce one evening (Who’s also joining us for a free webinar on March 27th) and hung out after dinner with Sean Ellis, founder of Growth Hackers. Both were speakers at the event and stayed all conference-long to meet and hang out with attendees. I had a beer with two guys from Google and Bob even got booked to speak in Estonia. 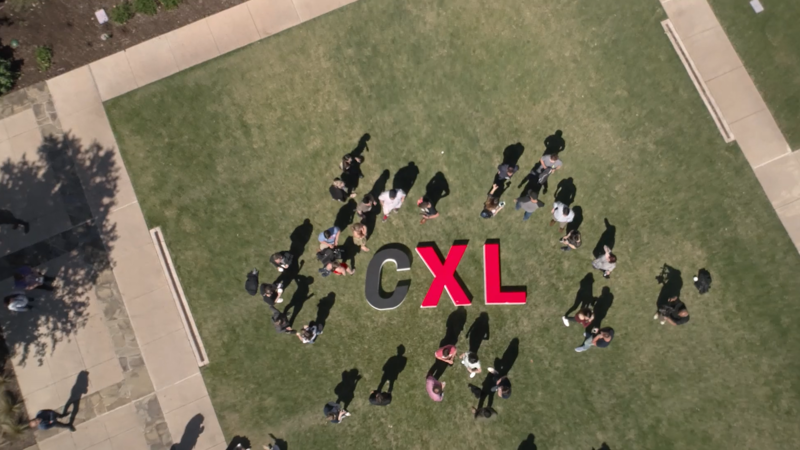 Some seriously cool things happened due to CXL Live’s intimate, rural setting. There are no other people on resort during CXL Live, so every single person you see and meet is a great connection. We were inspired by this as we built IMPACT Live, so if you were one of our attendees, know the CXL Live has the same vibe. Last spring when we attended CXL, we were focused heavily on improving how we used data to inform our marketing strategy (Enter Databox). As we re-evaluated what data we should really be paying attention to, Jared Spool, Co-Founder of Center Centre, rocked my world. His presentation mainly discussed how we can use data to better inform design. There are a lot of metrics we review, but they don't always tell us why we should certain things. It’s easy to jump to conclusions or read data that fits your agenda. For example, Google Analytics’ Time on Page metric shows you how long someone was on your page, of course, but there are a multitude of reasons why someone would have left. It’s up to us to use data to drive our experiments, rather than jump to conclusions. Another fascinating moment was when Guillaume Cabane from Madkudo (now VP of Growth of Drift) showed some insane examples of segmenting and personalizing your website experience before anyone ever converts using multiple data sources to extract user information. It was creepy but cool, and it opened my eyes to how much more we could be doing beyond HubSpot. There are some amazing speakers lined up for 2018 that I’m sure you’ll have at least 3 conversations that flip what you thought you knew on its head. Not signed up yet? Use the promo code impact-sent-me right here and you’ll save $350! I love big picture things, but if all you get are 30,000-foot views without any actionable data, conferences can feel exhausting. You end up having to exert more energy into digesting what you heard and figuring out how to apply it to your real life. That wasn’t the case with CXL Live. If Evernote had pages, I would have at least 10 full pages of actionable notes (and they also take notes for you if you just want to sit and listen). Every single speaker and I’m not exaggerating, gave information I could immediately apply to my work and how we can help our clients more. If you were a client with us last spring, you may have even seen some of what we learned applied to your marketing. (Ahem, Advanced Data Systems Corporation). All of our current clients see this in how we approach data, report with Databox, and use that information to inform our sprint planning. We’re more agile than we’ve ever been -- and we were able to kick it up a notch by attending CXL Live. CXL Live 2018 is just around the corner, and it’s not too late to register. I can’t talk up this conference without letting you know of a special offer we have just for our wonderful IMPACT Blog readers! Use the code impact-sent-me to get $350 off when you register for CXL Live 2018. Plus, it’s typically sunny and 70 degrees this time of year, so if you need a break from all the winter storms going on right now, come on down!